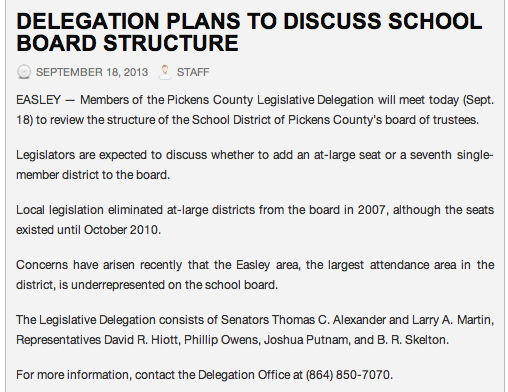 On September 9, 2013 @ 9:00AM … The Pickens County Delegation met to discuss The School District of Pickens County Board of Trustees Make-up and District Map. Members of the media did not find out about this meeting until AFTER the meeting had already begun possibly violating the public notice of quorum laws. • Pickens County SC State Senator Larry Martin, Clemson/Central SC State Represenative BR Skelton and Liberty SC State Representative David Hiott were the members of the delegation present. • School Board Trustee for Dacusville, Jim Shelton was present in the audience. Senator Larry Martin described the reason for allowing the public in the meeting: the Delegation is required to discuss County School Board issues in an open forum. Martin noted that the public was not given the opportunity to make comment/input today, because it would be allowed at a LATER date. • Martin described a 3 to 3 vote as, a failure. • Martin detailed the history of the School Board in Pickens County. • Martin discussed his negative considerations for adding an at-large member as resulting in a potential lawsuit under the Voting Rights Act. • Skelton disagreed with Martin's assessment of the Voting Rights Act & the at-large members. 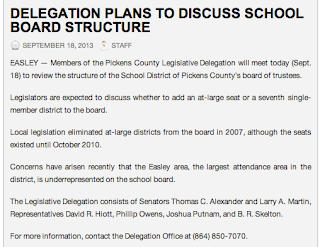 • Phil Owens said the argument for considering a 7th member is because the even number school board allows tie votes. Note that any board member added would favor Easley, Owens district. Why hasn't the Delegation also questioned the six districts of County Council? • Martin discussed a map of drawn attendance areas showing there are actually seven districts. The map did not break up any voting precincts. • Skelton moved to get public input before signing into law. • Hiott asked if there would be costs associated with making these changes. • Martin answered that the new voter registration cards issued last year would need to be replaced at a cost of $30,000 to $35,000, and that the School Board or County Council would have to pay the costs. Note: There would also be compensation for the board member, not to mention the cost of the election. • No date was set for public input. It should also be noted this meeting comes less than 24 hours after the Delegation met with the League Of Women voters and expressed full support of Common Core Standards for Pickens County.